We kicked off an amazing week last Sunday with a visit to Coochiemudlo Island Surf Life Saving Club, a small island off the coast of Brisbane’s bayside in beautiful Morton Bay. The day was made extra special as it was launch day for the club’s new kit that Sunrise At Bondi had had the opportunity to design and supply. The club has a proud history of being a family based club with a friendly atmosphere and that couldn’t have been truer with the reception that Maxi received when he stepped off the jetty onto the beach! 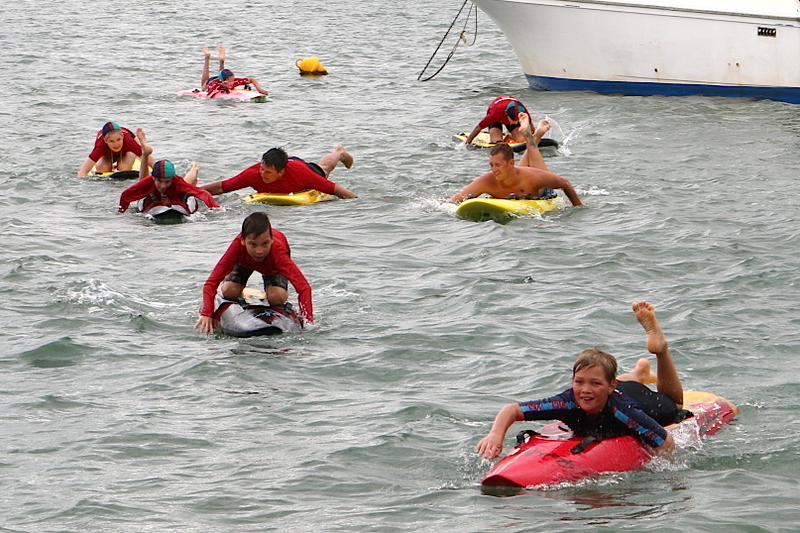 It was long before Maxi was in the water with the nippers taking part in a board race or 2 and then the crowd were keen to watch Maxi carry out a board rescue of club member Meg to perfection! The crowd then retreated to the beach to listen to Maxi talk of his own story of how he went from being a nipper in Sydney to the position of Bondi Lifeguard and then the members asked as many questions as they could think of! Selfies, a few autographs, great BBQ and a raffle for club funds rounded out an amazing morning, we can’t thank Club President Lance Price, Des Kerr, Chris McGrath and all the committee at Coochie enough for making us so welcome………. Maxi & I will forever remember our first SLSC visit, Coochie you are in our hearts, keep up the great work!